At the 19th Annual Bucks County Community College Journalism Forum, “Careers in Journalism-and Beyond,” professionals from the field spoke to attendees about their occupations and how journalism has shaped who they are and the jobs they do. In these ever-changing times, one takeaway was that journalism is alive and kicking, and although how it’s being delivered differs drastically from the way it used to be, there are always opportunities to be had for students who are interested in pursuing a career in journalism; and these traits can be applied to other jobs, too. In the first group of the forum were Mike Sielski, Sports Columnist, for the Philadelphia Inquirer, Timothy Carroll, Director of Communications at the New Jersey State Department, and Charlotte Reese, News Director at WBCB Radio, an AM station broadcasted from Levittown, Pa.
At just 23, Reese was the youngest speaker. A former Bucks student, she later transferred to Temple where she graduated in 2016 with a degree in Journalism. While a student at Temple, she interned at WBCB Radio, quickly becoming News Director just a few years later. Discovering her passion for news and reporting early on, Reese has fulfilled her dream as she works as News Director for the radio station, primarily working the early shift. For others, journalism wasn’t always their passion. Timothy Carroll found his passion for journalism while a student working for The Centurion here at Bucks. Although he initially wanted to only focus on Sports and Entertainment, a bomb threat on Campus which the President of the college concealed, sparked Carroll’s curiosity. While covering the story, Carroll soon became passionate about working for the paper, later becoming editor-in-chief. “Keep journalist ethos, always say yes,” Carroll says recalling his experiences as a journalist. “Cover the stories that others don’t want to,” he said. Carroll worked for the Hoboken Report in New Jersey before deciding to work for the state. As director of communications for the NJ State Department, Carroll still utilizes the skills he learned while working as a journalist. “Show up to work, ask questions, write, edit stories, develop skills. Create your own opportunities,” stated Carroll when asked about his advice for those interested in becoming journalists. Mike Sielski, a sports columnist for the Philadelphia Inquirer, covers all things sports in the city. From college basketball to the Flyers hockey team, Sielski reports the sports with a certain objectivity that isn’t found much these days. Despite being a native Pennsylvanian and watcher of Philadelphia sports for decades, Mike wants his reporting to always be factual. An avid Twitter user, Sielski’s opinions aren’t always popular with Philadelphia sports fans who often only want to hear the positive but Sielski knows that in reporting, the truth always comes first. Straying from the turbulent world of politics and its reporting, Mike says that he likes to focus on the sports world and chooses to keep his opinions on other issues to himself. As any good journalist does, Sielski likes to think outside of the box. While covering this past Super bowl, instead of agitating the players with the repetitive questions at a press conference held at the Mall of America in Minneapolis, Sielski decided to drive to Fargo, North Dakota to take a different angle. North Dakota is the home state of Eagles Quarterback, Carson Wentz who also attended college in Fargo. Wentz, who injured himself and could not play in the Super Bowl, still had legions of fans in his home state. Sielski interviewed those in the state to report on whether they would still be rooting for the Philadelphia Eagles even if their hometown hero was on the sidelines with a season ending injury. One thing that many journalism students want to know is how to get their foot in the door. “Work hard, commit to your craft, be versatile”, said Scott Bomboy, editor-in-chief at the National Constitution Center in Philadelphia. Bomboy who has worn many hats in his career as a journalist, was computer literate as early as 1987. This proved beneficial to his career in the 1990s, as the computer boom came and Bomboy had already had a decade of experience. “Do jobs that others don’t want to,” Bomboy continued pointing to the fact that the first job you get as a journalist may not be the one you want but you must start somewhere and work your way up. Richard Conte, editor for Dow Jones, believes that having “good contacts” and being an exceptionally good writer is what you need. “Read the description of a job you want in the future. Find out the requirements and learn them,” chimed in Annmarie Ely, Media and Public Relations coordinator at Delaware Valley University. “Think forward. Have a do it yourself kind of attitude. Prepare for transitions, find things that interest you and always look forward”, adds Timothy Carroll. Something all the speakers had in common was their passion for journalism. Taking different career paths, all speakers agreed that journalism is for those who truly have a passion for it. “You have to like it. You’re going to work odd hours and shifts,” said Scott Bomboy. Bomboy having worked in both television and print news, knows that flexibility isn’t always promised while being a journalist. “Be interested in talking to people. You have to like talking to people,” Richard Conte comments. “You have to ask the difficult questions and you really have to like writing. It’s going to be a struggle if you don’t like writing or talking to people”. “Approval is a difficult aspect. Negotiating can be very challenging,” said Annmarie Ely, while talking about the more challenging aspects of her job. The importance of continuing to use journalism to search for truth in a turbulent and ever-changing world was at the forefront of discussion lead by journalism professionals at the annual “Careers in Journalism and Beyond” forum. 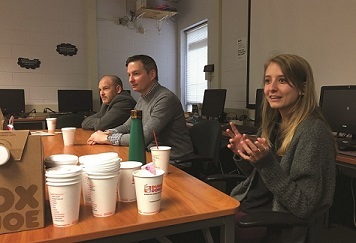 The roundtable discussion with journalism professionals kicked off bright and early in the Centurion newspaper room, 127 Rollins Center at the Bucks Newtown campus. A sizeable crowd already gathered for the first part of the event that ran from 8 a.m. to 9:15 a.m. It was free and open to the public. In the early morning session, the audience was able to hear testimony about the industry from three professionals: Director of Communications for the State of New Jersey Timothy Carroll, WBCB News Director Charlotte Reese, and Philadelphia Inquirer Sports Columnist Mike Sielski. Journalism professor Tony Rogers was there to supervise the event. Carroll, a Bucks alumni and previous editor-in-chief of the Centurion newspaper, kicked off the discussion with an animated monologue about his journey in his career and beliefs surrounding journalism. He had landed the editor-in-chief position after just one semester, after writing nearly 25 articles for the Centurion. Sielski followed up with an explanation of his own travels through the professional world of sports journalism. He spoke of getting his Masters from Columbia University, and moving to a variety of different reporting outlets, including the Wall Street Journal, before landing at the Philadelphia Inquirer. “Open mindedness is vitally important… we let our advocacy get in the way of our truth telling,” he told the group, before going on to tell a story about the latest Flyers Game as an example of seeking out the truth. “We went from a time of nightly news and paper to Twitter,” he said, telling the group the story of reporting on the game and hearing through Twitter about a rival player’s face being placed in the bottom of all the men’s urinals. He then spoke of standing in line for 10 minutes to confirm the rumors with his own eyes, as platforms such as Twitter can often times be easy to spread lies in. “Don’t take anything for fact, check it out!” Sielski urged. Charlotte Reese, a Bucks and Temple University alumni, wrapped up the initial introductions. At 23, she’s happy to be able to have such an influential platform available to her. Being the news director at the local WBCB 1490 AM radio station, she spoke more on the changes in the industry, inserting her own personal experiences. “We went through a lot of change, from moving from radio to now web stream and live stream,” she said, speaking of WBCB’s 60 years of supplying the local area with news. The forum was then opened to questions from the audience, allowing discussion to touch upon things like the availability of internships in the profession, and the value of having a well-rounded education, not just one focused on journalism. This forum was one of three different parts, the other two being held later in the morning and afternoon at 9:30 a.m. and 11 a.m.